To download the full PDF document version of the book synopsis, Click Here. Chapter 4 - Original Sin: Just Say No! Chapter 7 - Cain’s Lament: Don’t Let Them Kill Me! Chapter 10 - The Great Flood: Local or Global? Chapter 13 - "We Have Found the Flood"
When putting together a jigsaw puzzle, what is the most important piece? Something in the middle? An edge, a corner perhaps? No, it’s the box! On the lid of the box is a picture of what the puzzle will look like when the pieces are assembled. In searching to solve Bible, science, and history puzzles in most instances we don’t have the box. The big picture can only be seen when we put the pieces together. All we have are small bits scattered around, some easy to find, others well hidden. Besides the regular pieces, which when fitted together complete our picture, we are further confronted by illegitimate pieces tossed into the pile that may look authentic, but won’t fit. Now we are faced with evaluating each piece perhaps without knowing whether it belongs or not. So here we have a puzzle to put together with some pieces missing, some spurious pieces added, and no picture to examine on a box we haven’t seen. It sounds difficult, but we can do this. Let’s take four examples of bits of information we could come across any day that may be likened to pieces of a puzzle. In this case we are looking for a big picture of the world in which we live. 1. A story was published in The Washington Post from information provided by NASA scientists that they had analyzed data received from the Wilkinson Microwave Anisotropy Probe (WMAP). The space probe was designed to gather precise measurements of cosmic microwave background radiation, the technical term for the light left over from the Big Bang. With new information provided, the age of the universe can be measured at 13.7 billion years with a margin of error of only 1 percent. Will this piece fit our big picture? 2. A guest speaker at a nearby church says the rate of magnetism around the earth is decaying, getting weaker. This implies it was stronger in the past. According to the statistics presented, projecting the present rate of decay back 10,000 years would mean the earth’s magnetic field would have been "as strong as the magnetic field in a magnetic star." "That would limit the age of the earth to 10,000 years," the speaker states. Is this a perceptive analysis, or completely erroneous? 3. A New York Times article is titled: "Little Girl, 3 Million Years Old, Offers New Hints on Evolution." It begins: "If the fossil Lucy, the most famous woman from out of the deep human past, had a child, it might have looked a lot like the bundle of skull and bones uncovered by scientists digging in the badlands of Ethiopia. The paleontologists who are announcing the discovery in the journal Nature today said the 3.3-million-year-old fossils were of the earliest well-preserved child ever found in the human lineage. It was estimated to be about 3 years old at death, probably female and a member of theAustralopithecus afarensis species, the same as Lucy’s" A valuable piece of our puzzle, or should we cast it aside? 4. One issue of a pamphlet titled, "Acts and Facts" published by the Institute for Creation Research contains an article that states: "Creationists acknowledge the same genetic switch activating the sixth sense in sharks, and face and head development in people. But a similar switch doesn’t mean common ancestry. If this were true, the fossil record should document the amusing sea-creature-to-people transition." Is this a legitimate argument, or something for the scrapheap? Whether a data bit or piece of information is perceived as "true" or "false" often can be affected or even dictated by our own individual "world view." How we perceive reality can be shaped by education, religious training, upbringing, common sense, superstition and a host of other factors that may have nothing to do with the actual truth or falsity of any piece of information. In many ways our world view defines what we believe and what we are willing to accept or reject. But what if our world view, however it was shaped, wherever it came from, is just plain wrong? (Not yours, of course, but somebody’s.) How would such a person be able to analyze his or her own world view and know if it was right? Whether we are science educated or scientifically challenged, perhaps each of us can accept the premise that scientific methods, if properly applied, should give us reliable results at least most of the time. Scientific methods are simply tools we can use to evaluate information. In addition to science consisting of a body of knowledge, it is also a process. Science is a method or system by which we make observations, gather data, formulate theories, arrive at conclusions, etc. A method can be labeled "scientific" if it adheres to certain commonly-accepted rules that have been established to ensure accuracy. We might make an observation or witness a phenomenon. We may be able to make repeated observations and record precise details as to what we observed, although often times we do not have that luxury. We can make wild or educated guesses as to the cause of a particular phenomenon. Plain old guesswork may be used in the initial phase, and trial balloons sent up. The next phase may involve gathering data or conducting experiments. Using observations or experimental results, some of the derived data points may be connected up yielding one or more working hypotheses, which can then be tested. Some initial suggested answers usually are found wanting, and are put aside. Normally one or more of the working hypotheses can be supported by the data collected, and garners support as others begin to accept it, elevating it to the status of theory. In addition, pieces of information strung together should be internally consistent. In the four examples cited above, (1) and (3) are consistent with a global and universal habitat that is billions of years old, and if that is compatible within our world view, those items are likely to be accepted at face value. If, because of our religious convictions and what we may regard as "true," our world view restricts this universe to an age of approximately 6,000 to 10,000 years, then items (2) and (4) are likely to be favorably received and (1) and (3) ignored. Whatever our world views may be at the moment, whatever we have been taught to believe, whatever our level of education, let us try to set it all aside for the time being and consider that there may be some things we have not heard of before, that possibly run counter to our present world view, that have merit. Yes, but how do we know what we are exposed to is true or not? Of course, unless we know something is a fictitious tale, we would like assurances that what we are exposed to, and especially what our children are exposed to, has a basis in fact - especially in the area of religious beliefs where a wrong decision may have eternal implications. Alas, having faith that something is true and proving it true can be two different matters. In lieu of the intercession of Divine Providence, the best we can do is to weigh the cumulative data and evidence and, whether well-educated or not, evaluate it for ourselves and decide accordingly. At this point, some will say that all it takes is faith. Religious beliefs do require a measure of faith. On the other hand, cults, false religions, and atheistic beliefs likewise are based on faith. Many are born into families with their religion mandated from birth. Others become persuaded by emotions, or by a welcoming, loving congregation, or an appeal to common sense. So a "Thomas-like" approach (John 20:26-28) may not be a bad idea. Show me the goods, Lord, and I’ll believe. Separating what may be true from what is likely false is not an insurmountable task. There are tests we can apply. Does the information come from a credible, knowledgeable source? Is it plausible? Is it verifiable? Does it accord with Scripture? Is it internally consistent with other pieces of information we have already confirmed? And we can seek the opinions of others. They may see logic flaws we don’t. In the pages to follow, a voluminous amount of historical data and evidence will be displayed that point toward conclusions that have somehow managed to elude the Christian community at large for lo these many centuries. We will discover that Genesis 2-11 can be considered historically sound; these much-maligned chapters have historical integrity. Genesis is not concerned with the introduction of Homo sapiens to the animal kingdom as many have commonly misunderstood. What was handed down to the Israelites as the history of their generations, somehow, was taken by our early church fathers as an abbreviated history of our species. This interpretation has endured in spite of numerous archaeological, biological, anthropological, and genetic discoveries to the contrary. We will discover in the pages following that all of Genesis 2-11 concerning Adam and Eve, the Garden of Eden, the Genesis Flood, the Tower of Babel incident, and the early life of Abraham fit neatly within the historical confines of the ancient Near East, present-day Iraq, within a time frame beginning about 5000 BC to roughly 2000 BC. 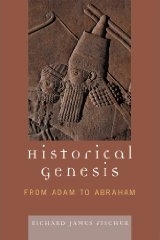 Abundant literature provided by the Sumerians and Akkadians who lived in the region during that time frame confirms the Genesis account. Some ancient Near Eastern inscriptions parallel biblical passages word for word and phrase for phrase, and are valuable pieces of our puzzle - in this case, a much smaller puzzle. Here we are only concerned with Genesis and its historical background. Yet this small picture still must fit within "the big picture." This history is not an allegory or a parable. The allegorical interpretation is a favorite one with those who see that our author is a philosopher, and cannot bring themselves to believe that so advanced an Israelitish writer could have held literally to such crudities. But the text offers no support to this manner of interpretation. As the penalties of chapter iii are simple historical realities for the author, so the course of events to which he ascribes them has a similar historical character in his mind. The serpent of the beguilement is the serpent of the curse, and the tree is as real as the man. Early Genesis is abbreviated history to be sure, and some passages are still open to varying interpretative schools of thought. Taken as a continuum, however, as a complete body of information, we will see that these ten chapters, from Genesis 2-11, have historical and archaeological underpinnings hitherto largely unreported. Genesis commentaries stacked on shelves in seminaries, libraries, and Christian colleges should have been useful, but for the most part, they follow the accumulated errors of predecessors. Even when ancient Near East material came to light, either it was given only passing remarks buried in the footnotes, or scarcely incorporated. Not phased by an abundance of archaeological evidence, new generations of Bible scholars largely followed erroneous but time-honored tradition. For those who, because of their science or academic training, may have thought Genesis was at best naïve or at worst mistaken, here is the evidence otherwise. For others who may have considered Scripture to be disconnected from science and history due to their religious convictions, that is a misunderstanding which needs correcting. In assembling these pieces in the following pages this is not to imply that still more corroborating pieces of information can’t be found. By all means, this book should encourage those who wish to explore further. In the following chapters, we will assemble a significant number of pieces of a puzzle from which will emerge a complete picture – one that takes a high view of Scripture, fully respecting the current findings of modern science, consistent with ancient history. And the picture is not likely to be one you have seen before.